In South Africa Zatopek (Zet to his friends) van Heerden is an ex cop now working, reluctantly, as a private detective. Lawyer Hope Beneke hires him to find the will of an antiques dealer called Johannes Jacobus Smit who was killed in his home nearly a year earlier. If the will is not found within seven days Hope’s client, Wilna van As who was Smit’s live-in partner, will not receive any of Smit’s estate. One thread of this book takes off then as a fairly standard, if action-packed, procedural that counts back from Day 7 through van Heerden’s investigation into what happened to Smit and where the will might have ended up. The other thread of the book, revealed in alternating chapters, is a recounting of Zet’s life from his childhood onwards to his present circumstance of being self-proclaimed trash with evil in his heart. The flawed protagonist is certainly not a new invention but I did find myself completely engaged by Zet van Heerden whose route to personal destruction is far from run-of-the-mill. The son of a miner and an artist, Zet’s journey to becoming a policeman and profiler is revealed in such a way that it feels perfectly natural and entirely believable even though it described many events which are completely foreign to me. One of the things that I like most about the characterisation of Zet is that although he’s depicted as quite sad, even depressed at times, he’s not always so and he does maintain some healthy relationships. For example he’s very close to his mother, the only woman he cooks for, and manages to make great friends with some unlikely people along the way even if he struggles to find the kind of love his father and mother shared. The plot is quite complicated, with both threads getting sidetracked at times, but I found it remarkably easy to follow which is a credit to both Meyer’s writing and the excellent translation from Afrikaans by Madeleine Van Biljon which has retained all the bantering and colloquialisms that are sometimes lost in translated novels. As often happens with thrillers I did find the ending a teeny bit disappointing in terms of the alarming number of testosterone fueled shoot-outs that took place, but overall it was interestingly paced, full of suspense and quite unpredictable. Along the way there are some absolutely beautiful vignettes, such as when Zet and Hope discuss their personal feelings about the country’s referendum on apartheid in 1992 or when Tiny Mpayipheli, a man Zet engages to protect his mother when the search for the will gets dangerous, describes a rugby match he played in the Soviet Union. Dead at Daybreak is a little more noir than what I tend to think of as ‘my’ kind of crime fiction but I found it captivating. Alongside the male-dominated narrative and the shootouts at the end there’s plenty of heart and intelligence in this book which made it a very satisfying reading experience for me. Saul Reichlin added to my enjoyment with his wonderful narration which included excellent South African accents that helped make me feel like I was half a world away and he might just have the sexiest voice I’ve heard on an audio book. Ever. The only other book of Deon Meyer’s that I’ve read (so far) is Devil’s Peak which I thought was so good it made it into my top ten reads for 2008. 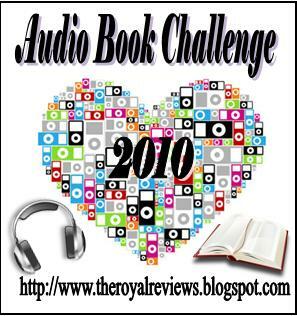 This entry was posted in Audio Book Challenge 2010, book review, Deon Meyer, South Africa. Bookmark the permalink. Bernadette – Thanks for this terrific review. I always learn so much from reading your reviews. 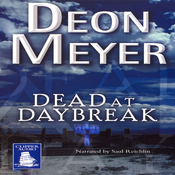 I “met” Deon Meyer in Blood Safari, and, although I haven’t read this one, I know I’m probably going to. Meyer has a terrific writing style and really can transport one to South Africa. I agree with you, by the way, that narration makes a huge difference for audio books. Even a good story falls flat if the narration isn’t good. Great review, Bernadette, as usual! I have got very keen on Deon Meyer as I think you know – I’ve read him in a funny order because of reviewing commitments – I reviewed Blood Safari and (just this last weekend) 13 Hours for Euro Crime – these are the two latest. Because I liked Blood Safari I bought all his backlist (frequent Petrona lunatic behaviour) and read the first, Dead Before Dying (which is the one before the one you review here, I think). I liked DBD a lot too. I am trying to pace out the remaining three – this one, Heart of the Hunter (which I think is the one Mack reviewed recently) and Devil’s Peak which both you and Karen M have tempted me with! Unlike some authors, one can read Deon M a bit out of order as the books aren’t straight accounts of the same protag (though Benny G is a recurring favourite) – some main characters in one are mentioned briefly in another book. Blood Safari, for example, has a detective agency in common with other books but (I am told) not much else. Enough rambling! The author is coming to the London Book Fair this month as part of the South African festival bit, but I think it is on the day we can’t go.. It is so nice to find an author that you CAN read out of order Maxine. I know have lots of books on my TBR pile but quite a few are not really available to me as I’m waiting to get an earlier book or books in the series. I definitely plan on reading the rest of Meyer’s books as I’ve been so impressed with the two I have read.